Full of Hot Air|Radiant Prof. Srvs. There is a great story that demonstrates the fragile nature of communication. The utility of this story is that it has been told many dozens of ways substituting political parties, various career types, schools and so forth in its punch line. You may have your favorite personalities, and that is part of what makes it fun – that it can be finished so many ways. There was once a tourist who had always been fascinated by the idea of a hot air balloon ride. At the spring fair one year, he came across one available for hire. While the pilot was making last minute preparations, the balloon got away from the pilot, and the tourist was alone in the basket. Within minutes, he was in the clouds and the currents carried him over the hills. Who do you blame for the miscommunication in this story? Interestingly some will point to the guy in the balloon while others are convinced it is 100% the fault of the man on the ground. Perhaps the most accurate answer is not one or the other, or both – but each. At several points in the interaction, there were chances to make it work for them. Don’t many people do this? How can we use the ideas from the communication chain to salvage this exchange? For many the temptation is to resort to a snide response to the other person because the context should be obvious. However, the reality is that exchanges like this play out every day because what we think is obvious may not be. What the man in the balloon did not remember was that there is no reason, based on what the man on the ground saw, to believe he was anything but a professional balloonist. 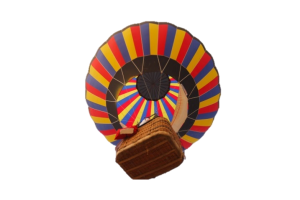 As a balloonist, it would be reasonable to assume he would know where he was: both in a basket, by altitude and where on the map. The man on the ground could certainly help the conversation. He could have used empathy and context to anticipate what information the balloonist might have needed. Of course the balloonist knew he was in a basket, so that was probably not the information needed. What was more likely was that the balloonist would want or even need to know where geographically he was. He also could have been more understanding when it was clear the answer he gave was not what was needed. The man in the balloon could have helped himself, and after all it was him that needed some assistance. When he got an answer that didn’t help him, he lashed out and blamed the guy on the ground that did not help his situation in the balloon. He is still lost and now the person who can help him has been insulted. Whether he was right or wrong, his response put him further from getting the help he needed. Maybe you know someone people who do this, too. A little more trying to help and a bit fewer assumptions and we can make our communications flow so much better. I hope you enjoy this article. This is an extract from the book CYA+: Complete Your Accountability available online. Order your copy today.